I sat glued to my computer screes all weekend watching the CrossFit Games. My friend Gus Vandervort participated in the Master’s 55 and older category, so of course I wanted to see his every performance! Additionally, watching all of the athletes, ranging in ages range 14-60+ are beyond inspiring! The workouts were grueling and these athletes completed no fewer than 11-12 events over a 4 day period. Their recovery time seemed shorter each day, however with the sound of the horn at the beginning of each event, their game face was on and they were as ready as if each event was their first. These athletes dedicate every day to being their very best. They eat, sleep, breath and train CrossFit every minute of every day. They are completely dedicated to their sport. Anything less than 100% does not lend one to this high of an achievement! The CrossFit Games athletes are the 1% of the CrossFit population. They are the elite, and their training is quite literally a full time job. As a recreational CrossFitter, we don’t have much in common with them, so it may seem…however, I think we have more in common than we realize. You cannot come to CrossFit once or twice a week and expect to learn CrossFit. CF is a weekly, monthly, yearly, journey. The process to learn all of the movements and skills necessary to grow in the sport is one of dedication and commitment. 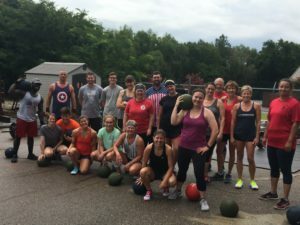 If you have chosen CrossFit as your method of training, and you’ve bought into it hook, line and sinker, then that is the first commonality between us and them. To quote Greg Glassman, “While CrossFit challenges the world’s fittest, the program is designed for universal scalability, making it the perfect application for any committed individual, regardless of experience. We scale load and intensity; we don’t change the program. The needs of Olympic athletes and our grandparents differ by degree, not kind.” If you show up to each class and you give 100% to learning, growing and becoming not only a better CrossFitter but also a better human, then that too is something we share with the 1%. While watching this weekend (and years past) it doesn’t take long to see one of the greatest things about CrossFit, and that is its community. At no point during the CrossFit Games was anyone left alone on the floor to struggle through their final reps. Within seconds of the other athletes recovering from their event, they gathered to encourage the others competing along with them. In no other sport have I ever witnessed this type of camaraderie. 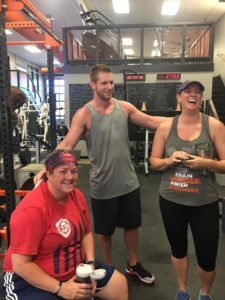 This type of camaraderie can be experienced in every local affiliate around the globe and in my opinion, is the most important element of CrossFit. If you’re here to just get in a good workout, then you’re doing it wrong. Be here to sweat, work and struggle beside those who are also sweating working and struggling. 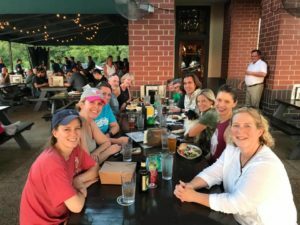 Be here to be a part of a community that is passionate about our sport, passionate about the changes it has made in our lives and share in our joys and our failures. A great workout is a piece of it, but it is perhaps less important than the community you are becoming a part of. Gus went on to finish 12th place in the Men’s 55-59 division, which is pretty fantastic! He had highs and lows in his performances, but one thing that stood out the most for him was the sense of community he felt among his CrossFit brothers and extended CrossFit community. In the end, isn’t a sense of belonging what we all strive for?